You are invited to see the award winning NCS Drama Department present “The Wizard of Oz.” The dates are February 25, 26. 28 and March 1 at 7:00 pm. 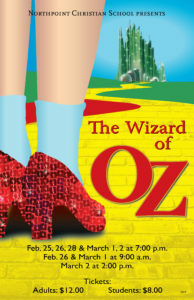 Matinee performances on February 26 and March 1 at 9:00 am. There is a Saturday matinee on March 2 at 2:00 pm.